Clovelly Bay is a great little spot located along the famous 'Coogee to Bondi' Beach coastal walk, where the swimming area has concrete platforms on either side making it 'channel' like and then with steps that lead into deep water beach. Clovelly has been described as looking a little like a submarine base but it is a great spot for swimming and snorkelling and so close to the Sydney metro area. Swim in the public pool on the side or choose the 'channel' like experience. 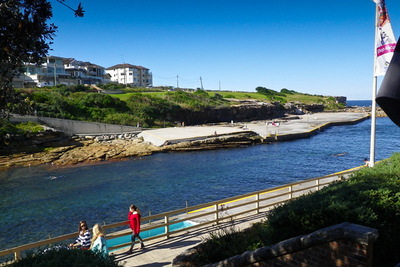 Clovelly offers safe swimming for kids and is popular for snorkelling. This eastern coastline offers so much variety with each beach offering something unique to its own. Very busy in summer and the weekends, however from the end of April onwards you can experience some refreshing cool and quieter times. The complete coastal walk from Coogee to Bondi is 6km and can take up to 2 hours at a leisurely pace. Take the walk and you will see many coastal surprises along the way. Sea Salt Cafe Clovelly Beach is in a superb location with views similar to those shown in the photo above. Settle in for a nice lunch or for breakfast in the morning. If your visit here is part of the 'Bondi to Coogee' Coastal Walk and you choose to stop to 'rest and revive' along the you may just find it hard to pick yourself back up again to continue on. Read more about the Bondi to Coogee Coastal walk on the 'All Around Bondi' weekendnotes article here.